Radio astronomers and solar effects observers who wish to monitor and analyse data from local and/or remote instruments. It also has the ability to import images from observatory video cameras. Starbase is intended for the collection, analysis and storage of data from multiple data sources, specifically (but not exclusively) for astronomical applications. Control a UKRAA VLF via a UKRAA controller. Output an accurate VLF frequency for tuning (depending on your soundcard). Control a sensitive Magnetometer via a UKRAA controller. Take NMEA input from a GPS receiver. Starbase will provide accurate NTP-synchronised clocks that give integral PC-independent clocks for UTC and sidereal time and can be NTP synchronised. The primary benefits of Starbase are that it is Open Sourced, Platform-independent, and will allow you to use instruments 24/7 without running a dedicated PC 24/7 with its associated running costs. Starbase is a general-purpose, open source, Java software package that is platform-independent and will run under MS Windows, Linux, and MacOS. It is developed by the UK Radio Astronomy Association (UKRAA). The current release of the software contains an Observatory, with facilities to collect data from local instruments and data-loggers or remotely over the Internet. Starbase software is not intended to replace the hardware of a realtime data logger. Planned future software plug-ins include a data repository and an analysis package. The Starbase Observatory communicates with instruments (for control and data collection) using a robust error detecting protocol, presenting their data in a consistent way and allowing storage and retrieval from the local file system. The instrument control structure is defined by editable XML files. This allows new instruments to be readily incorporated into the observatory. The Observatory communicates with instruments either via the serial port with RS-232 or RS-485, or via an Ethernet connection. Software instruments entirely resident on the host computer are also supported. Starbase is fully configurable and extendable by editing XML files that follow a strict structure (a 'schema'). Some customisation will be required for your particular needs; this is readily achieved by some simple editing of text files. The Observatory currently connects to external data loggers, a VLF receiver, magnetometer, SpectraCyber (local and networked), GOES server, FTP servers, NTP services, GPS receivers, a terminal emulator, and an Ethernet webcam. It can import and export data in comma-separated value (CSV), tab- separated value (TSV), most combinations of XML, RadioSky Pipe (RSP), GOES data, RSS feeds and even Twitter. Images in JPG and PNG are supported. There is a built-in webserver, a user-configurable astronomical ephemeris, and a simple time proxy for accurate timing. The software is designed to adhere to all applicable international standards wherever possible. It uses the ISO standard for dates and times, rather than confusing culturally-specific formats, and the Système International d'Unités (SI, or Metric) system for all dimensional units. Dr Laurence Newell has made a short introduction to radio astronomy and Starbase shown below. The following article was first published in 'The Society of Amateur Radio Astronomers' journal October ~ November 2011 and reproduced here with kind permission. 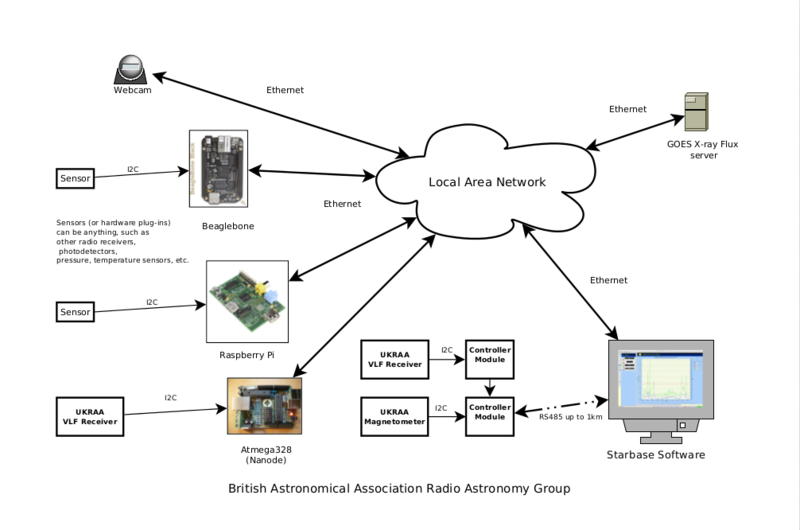 This paper is an overview of a general-purpose Java software package called Starbase, which was written by myself, and further developed and distributed by the UK Radio Astronomy Association (UKRAA)  on behalf of the Radio Astronomy Group (RAG)  of the British Astronomical Association (BAA) . It is intended for the collection, analysis and storage of data from multiple data sources, specifically (but not exclusively) for astronomical applications. As with most technical papers, I use a lot of abbreviations and acronyms. To help the reader, I have provided a Glossary at the end. Download the SARA Article Here. ukraastarbase @CarolineLucas @Strike4Youth Excellent! Thank you so much.